If you do not like broccoli rabe because of its slightly bitter taste, try this recipe. By cooking the broccoli rabe in salted water and then sauteeing it in garlic and onions, any hint of bitterness is removed. Fill a large pot with water and three tablespoons of sea salt. Bring the water to a boil. Add the broccoli rabe. Cover and cook for four minutes. Remove the broccoli rabe and let it drain in a colander. Save the cooking water in the pot. Begin cooking the spaghetti in this cooking water according to the package instructions until al dente (soft but firm to the tooth). Into a skillet, add the sausage links and one tablespoon of olive oil. Cook on medium heat until the sausage is browned. Remove the sausage. Add the garlic, onions, and crushed red pepper flakes into the skillet. Cook on medium low heat for three minutes. Cut the sausage links into 1/4 inch circles. Add the cut sausage back into the skillet. Add the broccoli rabe and 1/2 teaspoon of sea salt. Stir all of the ingredients together. Add 3/4 cup of the pasta cooking water to the skillet. Cook the sausage and broccoli rabe on medium heat stirring occasionally for five minutes. After the spaghetti is al dente, drain the pasta in a colander. Add the spaghetti back in to the pot it was cooked in. Add three tablespoons of olive oil and stir so that the spaghetti gets coated with the olive oil. Add the broccoli rabe and the sausage. Cook all of the ingredients on medium heat stirring well for three minutes. Turn off the heat. Squeeze the lemon juice on the pasta and serve with grated cheese. Fry the eggplant in batches in olive oil until brown on both sides. Let the eggplant slices drain on a paper towel. Sprinkle the top of each slice with sea salt. Into a mixing bowl, add the tomatoes, a tablespoon of the basil, a teaspoon of sea salt, and the crushed red pepper flakes. Mix well and set aside. Into another mixing bowl, add the egg, the ricotta cheese, the half anf half, a tablespoon of the basil, the parsley, two tablespoons of the grated romano cheese, a teaspoon of sea salt, and the black pepper. Mix well and set aside. 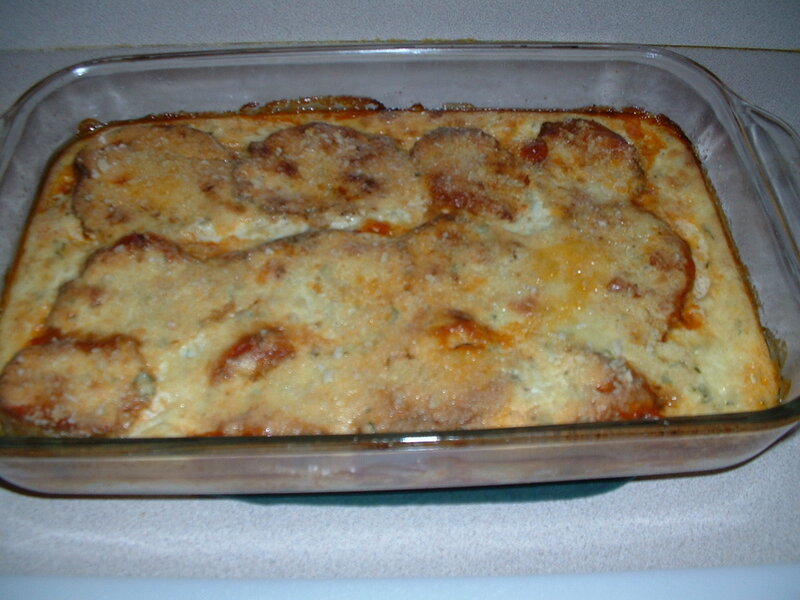 Put half of the eggplant slices in a single layer in a greased casserole dish. Pour half of the tomato mixture over the eggpalnt slices and spread the tomatoes out evenly. Sprinkle the top of the eggplant slices with grated romano cheese. Add the rest of the eggplant on top of the existing layer of eggplant. Top the second layer of eggplant with the remainder of the tomatoes and spread the tomatoes out evenly. Pour the the ricotta cheese and egg mixture evenly over the top of the second layer of eggplant. Let the mixture flow down the sides of the eggplant layers. Cover the top of the casserole with the remainder of the grated romano cheese. 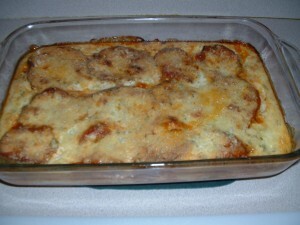 More romano cheese can be added if desired. Bake in the preheated oven for an hour until golden brown and the ricotta cheese and egg mixture has set. Into a sauce pan, add the arborio rice, 2 and 1/4 cups of cold water, and a teaspoon of sea salt. Bring to a rolling boil. Stir once. Cover with a lid and simmer on low for about 20 minutes until the rice has absorbed all of the water and is tender. Fluff the rice with a fork and set the rice aside. Cut the tops (where the stem is) of the peppers off. Remove the stem and seeds. Remove the white ribs inside the peppers, also. There should be some remaining flesh (excluding the stem) on the pepper tops. Finely dice this pepper flesh and set it aside. Sprinkle the insides of the cleaned peppers with sea salt and ground black pepper. Steam the peppers for about three minutes in a covered pot with one inch of water. Set the steamed peppers aside. Into a large skillet, add the olive oil, ground pork, sausage, a teaspoon of sea salt, 1/4 teaspoon of black pepper, and 1/4 teaspoon of crushed red pepper flakes. Cook on medium high heat until the meat is browned stirring frequently. After the meat is browned, add the onions, the excess pepper pieces, the garlic, and the celery. Cook while stirring frequently for 5 minutes. Into a mixing bowl, add the rice, the cooked meat with the cooked vegetables, the tomatoes, the red wine vinegar, two tablespoons of romano cheese, the basil, the parsley, 1/4 teaspoon of ground black pepper, and a 1/4 teaspoon of crushed red pepper flakes. Fold all of the ingredients together. Taste and add more sea salt and/or pepper, if needed. Add the beaten egg to the rice and meat mixture. Mix well until the egg is incorporated. 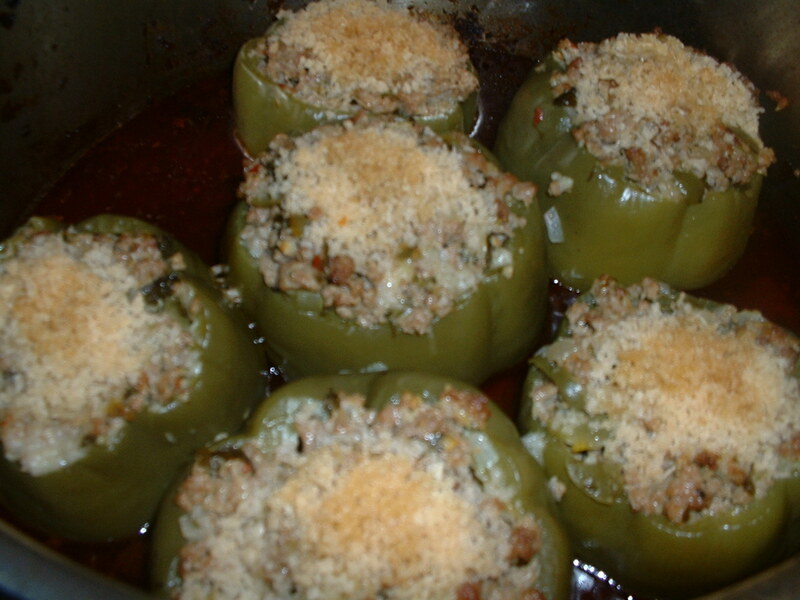 Fill the whole peppers with the rice and meat mixture. Top the stuffed peppers evenly with the remaining grated romano cheese. Bake in the preheated oven for an hour. This easy-to-make barbecue sauce is great on pork ribs and chicken. Put all of the ingredients into a small sauce pot (saucier). Cook on low heat while stirring. When the sauce begins to boil slightly, remove from the heat. Let the sauce sit at room temperature for at least an hour before using it. Note: If you want a sweeter sauce, add more brown sugar. If you want a spicier sauce, add more hot pepper sauce. Put all of the ingredients except the salmon filets into a mixing bowl. Whisk together until well blended. Put the salmon filets into the mixing bowl with the marinade and place the bowl in the refrigerator for an hour. Grill the salmon filets flesh side down over a hot gas or charcoal grill for 5 minutes. Turn the filets over and cook the skin side for three minutes. Remove the salmon filets from the grill onto a serving plate. Garnish the salmon with sesame seeds and serve with lime wedges. A non-stick grill pan is preferred but a non-stick skillet will work fine. Heat the grill pan on the stovetop on medium heat for 4 minutes. Place two slices of tomato on a slice of ciabatta bread. Sprinkle the tomatoes with sea salt and ground black pepper. Place half of the basil on top of the tomatoes. Place one mozzarella slice on each tomato. Place a slice of ciabatta bread on top of the mozzarella slices. Brush both sides of the sandwich with olive oil. To make the second sandwich, repeat the same process. Put the sandwiches on the grill pan. Put a heavy pan or pot on each sandwich to press it down. Cook for about three minutes on each side or until golden brown and the cheese has melted. Cut the panini sandwiches in half and serve. Into a large saute pan, add a tablespoon of olive oil and the sausage. Cook on medium heat until the sausage is browned. Add another tablespoon of olive oil, the eggplant, the crushed red pepper flakes, and the sea salt. Continue to cook on medium heat stirring frequently for 4 minutes. Note: add more olive oil if the eggplant absorbs it all and the pan becomes dry. Add the onion and garlic. Continue to cook for three more minutes stirring frequently. Add the tomatoes. Stir to incorporate. Reduce the heat to low and cook for 10 more minutes. Cook the ziti in a pot of salted water according to the package instructions. Before draining, reserve one cup of the pasta cooking water. To finish, add the drained pasta to the pan with the sauce. Cook together on medium heat stirring constantly. If the pasta appears too dry, add some of the reserved pasta water. The dish is done when all of the pasta has been coated evenly with the sauce. Turn off the heat. Garnish with the fresh basil. Serve with grated cheese. Heat a large non-stick skillet on medium high heat for 3 minutes. Add the canola oil, sesame oil, green beans, zucchini, scallions, ginger, garlic, jalapeno pepper, and the sea salt. Cook on medium high heat for seven minutes stirring constantly. After seven minutes, push the vegetables to the side of the skillet. Add the beaten eggs to the center of the skillet. Cook the eggs for 3 minutes stirring constantly. After the eggs have cooked, stir the eggs with the vegetables so that all of the ingredients are mixed together well. Add the rice and the soy sauce. 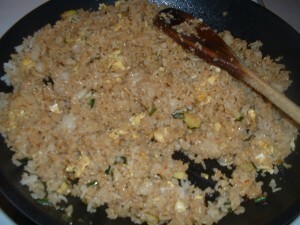 Cook the rice and the vegetables with the soy sauce for three minutes stirring to incorporate all of the ingredients. 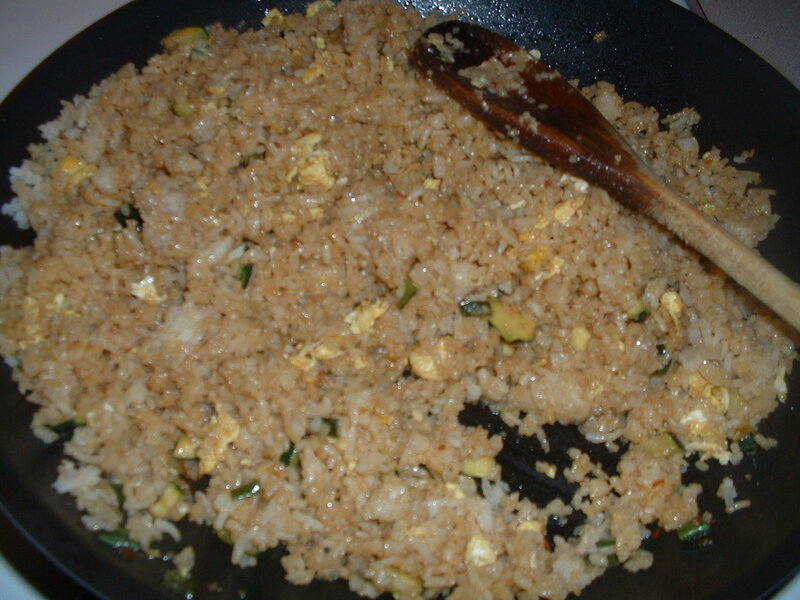 The dish is done when the rice has been heated through and takes on a light brown color. Taste and add more sea salt and/or soy sauce if desired. Garnish with the chopped peanuts, sesame seeds, and cilantro. This simple vegetable dish is a perfect accompaniment to any grilled meat or seafood entree. Brush the zucchini with the olive oil on both sides. Sprinkle the zucchini on both sides with sea salt and ground black pepper. Place the zucchini on the grill. Cook each side for 3-4 minutes until brown grill marks are achieved. Remove and serve with fresh lemon wedges. A perfect meal to cook on a Sunday afternoon. The leftovers are awesome, as well. Season the pork ribs and the beef ribs on both sides with sea salt and black pepper. Add the olive oil, the pork ribs, and the beef ribs to a Dutch oven. Brown the meat thoroughly on medium high heat. When browned on all sides, remove the meat to a plate. Discard the fat in the pot but retain the brown bits that have accumulated on the bottom. Add the onion, garlic, two teaspoons of sea salt, and a pinch of black pepper to the Dutch oven. Cook on medium high heat for three minutes stirring frequently. Add the red wine. Cook the wine for four minutes scraping the bottom of the pot to loosen the brown bits that have accumulated. . Add the tomato paste and cook the mixture for one minute stirring constantly. Add the hand crushed tomatoes with the can juice, oregano, a 1/2 teaspoon of crushed red pepper flakes, and a teaspoon of sea salt. Bring the mixture to a gentle boil. After the mixture begins to slightly boil, reduce the heat to low. Tie the rosemary, thyme, parsley and basil into a bundle with cooking twine and drop this bundle into the pot with the tomatoes. Add the browned meat and any of the juices in the plate to the pot. Simmer this sauce on low heat for 3-4 hours stirring occasionally. After an hour, remove the herb bundle and discard. After an hour, taste the sauce and add more sea salt and/or pepper, if desired. 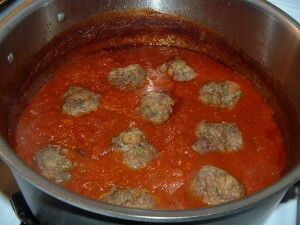 After the sauce has been cooking for two hours, add the meatballs (Note: the meatball recipe follows). Before serving, taste the sauce again and add more sea salt and/or pepper if needed. To make the meatballs, add all of the ingredients except for the egg into a large mixing bowl. Mix thoroughly with your hands. Beat the egg with a fork in a seperate bowl. Add the egg to the meatball mixture. Mix again to make sure that all of the egg is incorporated into the meatball mix. Rub olive oil on your hands and then form the meatballs (about golf ball size). 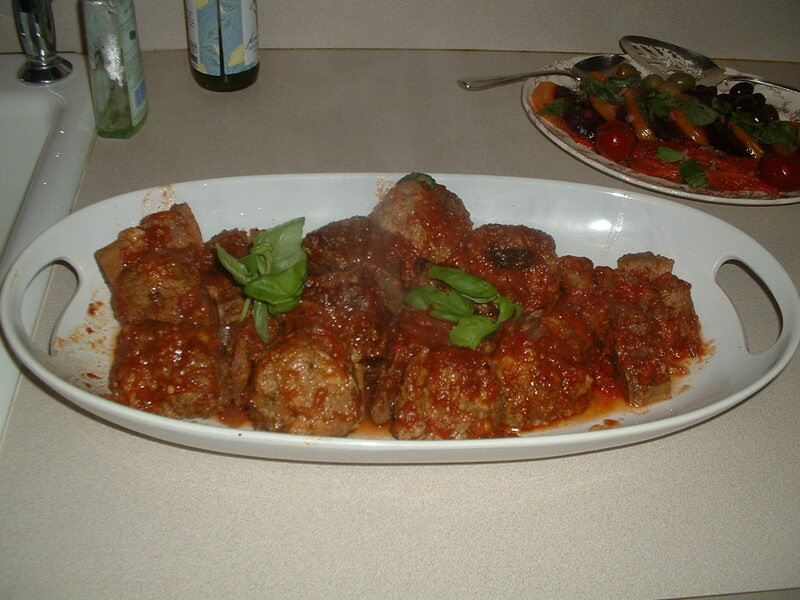 Put the formed meatballs on a gresed baking sheet and bake at 325 degrees in the oven for one hour. Note: I line the baking sheet with aluminum foil for easy cleaning. Serve the sauce over rigatoni, penne, spaghetti, or shells. The meat is served on the side on a seperate plate. Serve with grated cheese and crushed red pepper flakes.